Denouncing neoliberalism’s manifestations has become a boom industry for left-wing academics. It has become a practice so prevalent that even fusty establishmentarians like Stanley Fish have deigned to comment on the uses and abuses of “neoliberalism” as a moniker for the predominance of the market over politics, society, and culture in the present moment. Fernando Ignacio Leiva offers a sustained study of Latin America’s successors to the Chicago Boys in order to rectify notions of neoliberalism’s imputed “totalization.” Emerging in the 1990s from the United Nations’s Economic Commission on Latin America and the Caribbean (ECLAC), neoliberalism’s heirs promote a “globalization with a human face” contra the morally bankrupt free-market dogmatism of their predecessors. Alternatively, these neo-structuralists advance policies that seek to reinforce national democratic institutions, prompt localized participation of interested actors, reinstate development at the center of economic policy, and institute “a grand narrative about the path toward modernity that the twenty-first century offers Latin American and Caribbean societies” (xix). As promising as these claims appear to be, however, this new paradigm in economic policy is not the reversal of neo-liberalism, Leiva asserts, or even the utilization of “cold economic calculus” by the “warm hearts” of enlightened, center-left technocrats; rather, neostructuralism should be seen as neoliberalism’s compliment, “as part of a tag-team” (188). Before discussing the specifics of Leiva’s argument, it is worthwhile to note his methodology. Leiva approaches this problem in a way that frames economic analysis with literary theory in order to test economic theory’s procedures of making “truth claims.” According to Leiva, economics lacks the methodological tools and critical self-awareness available to social sciences and literary theory; following Terry Eagleton’s lead, Leiva therefore links the history of material and discursive practice for development paradigms and in effect elaborates their relationship to embedded power structures in Latin America (xxv). This fusion of approaches is generally seamless throughout, depending on Marxist conceptualizations of contradiction, and an emphasis on a trope of omission that runs throughout the policy documents and public comments of ECLAC researchers and by the governing administrations in Brazil and Chile. The primary examples of Leiva’s claims about the effects of neostructuralism in Latin America, Brazil (2002-6) and Chile (1990-2006), are selected, in the case of the former, for the size of its economy, and, in the latter, for the congruence of forms of sovereignty and economic policy regime in the country’s move from neoliberalism to neostructuralism (dictatorship/neoliberalism vs. democracy/neostructuralism). Exemplary as they are, these choices disregard other Latin American contexts where radical social fragmentation and civil war might present social, economic, and political barriers to the scope of Leiva’s claims about current sway of neostructuralist ideology in Latin America. Two contexts where such obstacles are demonstrably present include parts of Central America and Mexico. 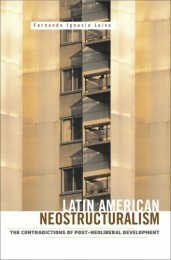 Nevertheless it is through the examples of Brazil and Chile that Leiva makes his second core argument: neostructuralism’s “conceptual retreats” prevent this new paradigm from usefully apprehending the transformations in Latin American capitalism by ignoring how power relations give shape to the implementation of development policy. In so doing neostructuralism rejects the concepts and frameworks developed in the 1960s intellectual traditions of structuralism and dependency theory. Neoliberalism’s upstarts rapidly abrogated the policies and legacies of these schools of thought just as, for Leiva, neostructuralism fails to recover them. Foremost in his mind is the abandonment of the core-periphery model of economic relations on the international stage. Concepts like the core-periphery model gave analysts the means to elaborate how colonial and postcolonial economies produce(d) raw materials almost exclusively to be processed in first world (core) economies, which in turn generated unevenness in the distribution and types of labor. For Leiva, this model crucially linked the origins of inequalities within the international division of labor to very development of capitalism (28). Leiva describes a second neostructuralist theoretical retreat in the paradigm’s disregard for a notion of surplus and therefore questions of the distribution of wealth. In the investigations of figures such as Paul Prebisch, researchers discovered that a surplus was being extracted from Latin American economies and diverted to industrialized nations. Surpluses were also conveyed domestically to the metropolitan center, which explains why “development” and growth amplify intra-national income and asset polarization. Leiva reveals how, historically, these theoretical apparatuses empowered critical economists to derive policy that would generate development, industrialization, and more dynamic economies by replacing processed commodities imported from industrialized countries with nationally sourced, processed commodities. The policy that substituted imported goods through state-funded industrialization came into crisis during the 1970s and with that crisis came a turn to the right in the form of the neoliberalist consensus. Theoretically, neostructuralist thought criticizes the narrowness of neoliberalism’s sense of growth and economic success, indicating that problems with the neoliberal model involve a failure to guarantee the distribution of globalization’s benefits to all sectors of society. Leiva devotes a full chapter to the policy innovations of ECLAC, and those it influenced, articulating more responsive and less socially deleterious growth models. One such conception involved the notion of “genuine” as opposed to “spurious” competition. Under neoliberalism “comparative advantage” (read: competition) dictated massive wage reductions and a devaluation of exchange rates. Leiva indicates that while this policy spurred investment, it trapped Latin American nations in the slowest growing parts of the international economy. Neostructuralists renovated the principle of competition, defining genuine competitiveness as a total social process wherein institutions, governments, culture, and individual affects are mobilized for the purposes of a cohesive, synergistic competitiveness in the international sphere. Conflict, historically construed between forms of worker advocacy/politics (as in unions) and management, is to be redirected to the goal of national competitiveness in the global economy (more on the political ramifications of neostructuralist policy later). This dichotomy between forms of competitiveness, according to Leiva, allows for the construction of a different model of growth that combines it with equity, a process described as the “virtuous circle.” Depicted as the expansive cycle propelling societies onto the “high road” to globalization, the virtuous circle delineates the mutually reinforcing steps that draw Latin American nations closer to the ever-elusive goal of modernity. Genuine, or systemic, competiveness fostered by the strengthening of institutions, proactive labor flexibility, and technical innovation lead to improved living standards, which mollify political conflicts and generate consensus useful for the export drive within the economy and increased value added to exported commodities. As opposed to the metaphor of “surgery” used to describe neoliberal economics in Latin America, the neostructuralist formulae insist on “holistic” approaches to growth, and yet the cures, under Leiva’s analysis, are primarily “homeopathic.” For example, the distinction between genuine, socially coordinated and affectively disposed competition and the spurious, short-term oriented comparative advantage as Leiva later demonstrates fails to actually distinguish competitive practices in the real functioning of markets because “it ignores the contradictory social and technical character of production, the labor process, and the valorization of capital itself” (112). In the case of Chile, as Leiva elaborates later, seventeen years of policy failed to convert the national economy beyond a low-processing (largely raw materials) export-orientation. The contract-free, precarious labor promoted by these policies failed to contribute to the virtuous circle, in effect “short-circuiting” its process (208). Efforts to produce labor markets better suited to the export economy circumvented precisely the beneficent cycle they were meant to institute, generating consequences comparable to those that followed from the “lost decade” in Latin America. However, the turn toward “consensus” and away from the authoritarian “coercion” of the lost decade, Leiva observes, produced a participatory society that is at the same time subordinate to the needs of transnational capital. For today’s readers it is perhaps these political ramifications that are the most pressing and most important. The discursive appeal of neostructuralist policy is its holistic approach, with an emphasis on actors at all levels of society inflating its triumph throughout the region by marshalling progressivism and democratic rhetoric. Neostructuralism finds in politics its widest field of application and the road along which it charts Latin America’s path to modernity (145). One of the primary vehicles to a renewed modernity is the emphasis on “participatory politics.” Here, Leiva draws particular parallels with notions of “participation” that emerged in Cold War and counterinsurgency contexts, where the rhetoric of civil society’s participation brought municipal decentralization to places like El Salvador to address grievances, shore up support for the government, and increase community involvement (151). Governments and international agencies channeled the rhetoric of participation to bolster economic liberalization by generating skills and “appropriate attitudes” in the poor and disempowered in order to anticipate and correct potential discontent with the uncertainties and social fallout from globalization (152). This newly generated state legitimacy through social cohesion is not directed at fostering popular sovereignty, but rather at facilitating the extraction of surplus and maintaining the status quo of the export-oriented regime of accumulation ushered in by neoliberalism. Indeed like neoliberalism, neostructuralism integrates a model of citizenship around the cost-benefit-analysis of homo economicus, with the addenda of difference, individuality, and cultural identity (157). Leveraging these postmodern matrices of citizenship for the further extraction of surplus in effect transfers responsibility for poverty reduction to the poor themselves. Leiva indicates how the poor’s cultural practices of survival and their “entrepenuerial spirit” are integrated into policy level calculations, streamlining accumulation processes, echoing George Yúdice’s arguments that culture’s function in the global age is to operate as an expedient for the alleviation of social conflict and for economic gain. The subcontracting of social services to NGOs similarly reduces accountability, channeling conflict elsewhere and “[smoothing] out those contradictions arising from the accumulation process itself” (163). To those that would argue for neostructuralism as the democratic, grassroots alternative to neoliberalism, Leiva reminds, “[t]ime and time again, history has punctured the emancipative pretensions of a wide gamut of economic and development discourses and progressive political projects” (147). The real alternative social models, according to him, exist in the Amazonian and Bolivaran visions in Venezuela and Bolivia where embedded power structures and transnational capital face challenges from the public sphere, even as they negotiate within the confines of modified versions of capitalism. For the time being, Leiva demands a concerted analysis of how development, economic policy, and the state all interact with entrenched social power, in the context of the persistent oligarchic and illiberal nature of Latin American politics in general. Latin American Neostructuralism represents the beginning of such an intervention. Written in a moment when attempts to “postmodernize” Latin American social theory by neglecting the historical claims by the popular sphere for redistribution of land, resources, and freedoms and instead emphasizing “negotiation” and contingency lose not only analytic vigor but in effect work toward the maintenance of the status quo. Yúdice, George. The Expediency of Culture: The Uses of Culture in the Global Era. Durham: Duke University Press, 2003. Eric Vázquez is a Ph.D. candidate in the Literary and Cultural Studies Graduate Program at Carnegie Mellon University. His fields of interest include culture’s relationship to warfare, globalization studies, U.S. Latino literature, and materialist thought.